Today we heard the story of a person literally at the end of ropes in a strange place. What is it like to be at the end of a rope hanging over the unknown? I had that experience once. I took students rock climbing and rappelling on the boulders outside of Tombstone, Arizona, site of the gunfight at the OK Corral. A retired Army Special Forces guy named Mike organized the trips to teach spiritual principles through great adventures. In case the terms are new, “Rock climbing” is going up a rock face, “rappelling” is sliding back down on a rope – you see it on military recruiting commercials. It was spectacularly fun. Afterwards, we went to dinner in town. We assumed we were done for the night, when the guide turned his station wagon back toward the desert and informed us we were going to night rappel. In the interest of full disclosure, I am a little bit afraid of the dark. Don’t laugh – You are too. There was a sliver of moon, which, in the dry air, lit the top half of the cliff face. An outcropping shielded the bottom from the moonlight, The bottom half was a dark mystery. 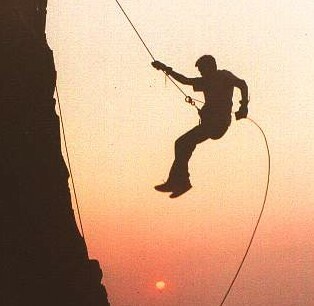 When rappelling you are attached to the rope by a metal figure 8. This slows your descent by friction. Placing your hand in the middle of your back with the rope in it acts as a brake and you stop. Moving your hand away from the middle of your back allows the rope to slip through the figure 8 and your hand, and down you go. I started the descent – nine stories in the dark. I get below the outcropping blocking the moon. Now in blackness, I slow to a crawl. I am shivering in the warm evening. “How is it going?” The guide yells down at me. “Great.” I yell up unconvincingly. “Sure is dark down here.” I say somewhat pathetically. I feel the end of the rope in my hand. “How far away is it?” The guide calls. Now depression sets in…and a little panic. Beads of sweat form on my forehead. “I hope you have some ideas, I’m stuck here.” I say nervously. So there I am, in a dark place, all alone…at the end of my rope. We have all been in dark places. Felt alone. As Christians, though, we know we are not actually alone, no matter how dark the night. We are, however, surrounded by people for whom “God with us” is not their reality. They are lost and hurting. In dark places. Alone. At the end of their ropes. Some are aware of this. Others not so much. Picture yourself at our Gospel event that long ago evening: A crowd shoehorned into a living room. The yard also jammed with people. In the crowd, you listen to Jesus teach when dust begins to fall from the ceiling of the sod-roofed home. Dirt chunks, grass and sticks fall to the floor in front of you. Heads pop through the hole. The vandals pull out beams, expanding their damage. And then down comes this guy, lowered in front of Jesus. Imagine the friend’s giddiness. Can you picture them staring through the hole yelling, “I told you so!” to their wobbly-legged friend? -Went as a team, rather than alone. -Knew that healing is found in a person, rather than a place. -Cared enough to bring him to Jesus. -Went to ridiculous lengths to put their friend in front of Jesus: They risked time, energy, potentially their self-respect, and, surely, a good bit of money at Home Depot afterward. They literally got their hands dirty to bring their friend to the Savior. What about you? Who are you a spiritual friend to? We have friends all around us who need the healing and forgiveness of the Lord Jesus Christ: at your work, school, in your family, surrounding your church. Are you willing to do whatever it takes to help them see Jesus…willing to get your hands dirty? Jesus saw “their faith.” Do you faith to bring Christ’s healing and salvation to your community? I don’t know your context. But I have looked at the demographic data for your schools. They are remarkably integrated. Why isn’t your church? Shouldn’t a church reflect its community? Why is your church mono-ethnic in an integrated neighborhood? Perhaps, as it was for the paralytic, the way into church is blocked? It isn’t always the crowds that keep people away from the Savior. Mark DeYmaz, in Building a Healthy Multi-ethnic Church, says the average American church is 10x more segregated than its neighborhood. Prior to coming to the Diocese I worked in a historically upper middle-class youth ministry in a neighborhood becoming less White by the year. We took our leaders to the high school quad and, while looking at real students, asked “Who on campus isn’t in our ministry and why?” Then leaders picked groups and went and got to know them. We hang signs that say, “We welcome you.” But what do we do to welcome people who don’t look like us? I came to the Episcopal Church in part because, in addition to promising Protestant theology with catholic worship, access to the wisdom of the earliest Christians and the hopeful idea that we could agree to pray the same words rather than agree on every theological jot and tittle, we believe in the dignity of those who aren’t like us. Unfortunately, “Welcome” is easier to paint on a sign than to do. Statistically Evangelical churches are much more integrated than Mainline churches. How is that possible? Perhaps while we were talking about justice, they were talking about Jesus. How will our children believe us that Christ loves the world and went to the cross for the salvation of humanity if the church looks completely unlike their world? We can do better for our children. What if everyone here said, “I don’t care what anyone says or thinks of me, the Christian message is true, so the most important thing in the world is the forgiveness and healing found in Christ.” What if out of that conviction each of us engaged in friendships with people who are unlike us? What if we talked to the under-represented about what would need to change in order for them to feel culturally welcomed while spiritually challenged. -Entire neighborhoods walking in the healing and forgiving love of Jesus. -Not just full churches, but joyful neighborhoods, laughter in the streets and hope in human hearts. …Back to my climbing story: It turned out I was only inches above the ground. Coming down the cliff face I had angled left toward the moonlight. The cliff bottomed into a downward sloping hill. I had moved just far enough toward the moonlight to leave the ground 2” below my outstretched toes. In the end, I had been afraid of a harmless unknown. Isn’t the unknown what we are really afraid of when it comes to opening wide our churches so that others could experience the love, healing, and salvation of Jesus? Are you willing to take a risk for the Kingdom? As one who is safe on the rope of God’s mercy, are you willing to go, make unchurched friends, and jump with them into God’s unknown? When we take a risk we never know what God might do. And, the paralytic that gets healed might just be us.